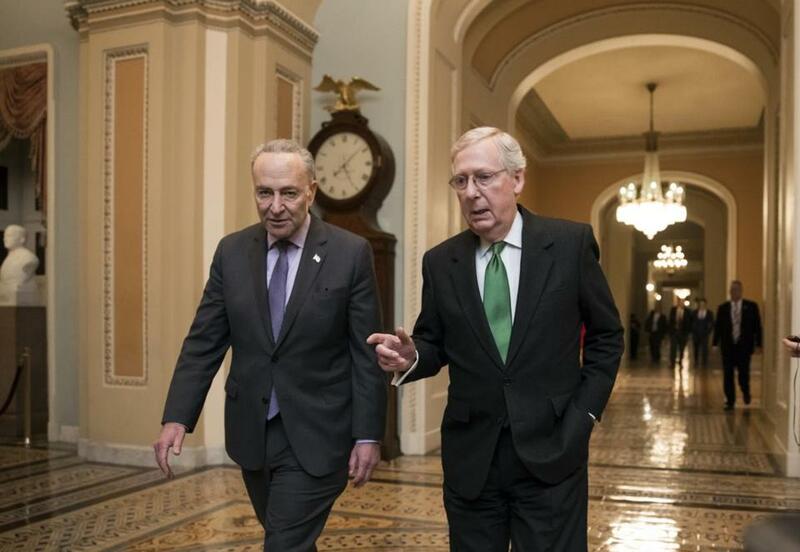 Senator Chuck Schumer, left, and Senator Mitch McConnell reached an agreement on a two-year budget deal that would provide Pentagon and domestic programs with huge spending increases. WASHINGTON — Senate leaders, disregarding President Trump’s threats to shut down the government, struck a far-reaching agreement on Wednesday that would add hundreds of billions of dollars to military and domestic programs over the next two years, breaking the cycle of fiscal crises that have bedeviled the Capitol since last summer. The accord, between Mitch McConnell of Kentucky, the majority leader, and Chuck Schumer of New York, his Democratic counterpart, would raise strict caps on military and domestic spending that were imposed in 2011 as part of a deal with President Barack Obama that was once seen as a key triumph for Republicans in Congress. The latest deal also includes an increase in the federal debt limit, said Representative Chris Collins, Republican of New York, though Senate leaders did not immediately announce that piece of the agreement. The spending caps would increase about $300 billion over two years, according to a congressional aide. The limit on military spending would be increased by $80 billion in the current fiscal year and by $85 billion in the next year, which begins Oct. 1, the aide said. The limit on nondefense spending would increase by $63 billion this year and $68 billion next year. The deal would cause budget deficits to grow even larger, on top of the effects of the sweeping tax overhaul that lawmakers approved in December. But because the agreement would give both parties what they want most, the deficit impact appears to be of little concern. Defense Secretary Jim Mattis, White House press secretary Sarah Huckabee Sanders, and House Speaker Paul D. Ryan all quickly embraced it. From the increase in domestic spending, Schumer said the deal includes $20 billion for infrastructure, $6 billion for the opioid crisis and mental health, $5.8 billion for child care, and $4 billion for Veterans Affairs hospitals and clinics. It also includes disaster relief for areas hit by hurricanes and wildfires. The deal also includes $4.9 billion — two years of full federal funding — for Medicaid in Puerto Rico and the US Virgin Islands, helping to avoid a looming Medicaid shortfall. There is additional money to repair infrastructure, hospitals, and community health centers severely damaged by hurricanes Irma and Maria. The relief aid also includes $28 billion in community development block grants, including $11 billion for Puerto Rico, with $2 billion of that to repair the power grid. About 30 percent of Puerto Ricans — more than 400,000 customers — don’t have electricity more than four months after Hurricane Maria. Puerto Rico requested $94.4 billion in aid after the storm. The agreement includes an additional four-year extension of funding for the Children’s Health Insurance Program, on top of the six-year extension that Congress approved last month, Schumer said. “I hope we can build on this bipartisan momentum and make 2018 a year of significant achievement for Congress, for our constituents and for the country that we all love,” McConnell said. Ryan urged his members to vote for it: “America will be safer and stronger because of this agreement.” His embrace boosted its chances in the House, where conservatives were cool to it, if not hostile. The deal also sparked opposition from the House Democratic leader, Representative Nancy Pelosi, who said she can’t agree to any budget deal not accompanied by a debate on protecting immigrants brought here illegally as children, known as Dreamers. “Without that commitment . . . this package does not have my support, nor does it have the support of a large number of members of our caucus,” Pelosi said on the House floor, where she spoke at length about Dreamers, referring to a promise by McConnell to begin debate on immigration soon, a commitment not matched by Ryan. “Speaker Ryan has already repeatedly stated we intend to do a DACA and immigration reform bill — one that the president supports,” said spokeswoman AshLee Strong, referring to the Obama-era Deferred Action for Childhood Arrivals program. The budget deal would be paired with a stopgap spending measure that would keep federal agencies open past Thursday, when the current funding measure expires.